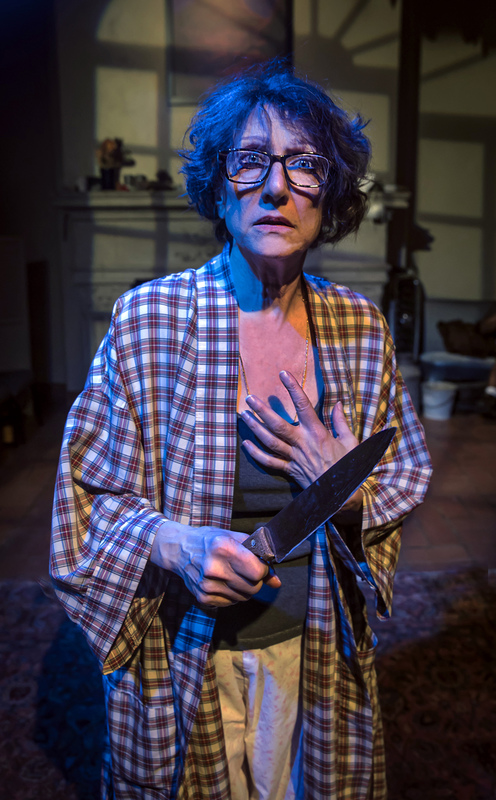 In a tour-de-force performance, Jan Zvaifler wallows gleefully in comedic chaos as the knife-wielding matriarch, Carla, in Central Works world premiere of “Palace Wreckers” by Gary Graves, a comedy inspired by the “Oresteia” of Aeschylus. Photo Credit: Jim Norrena. In Aeschylus’s bloody series of Ancient Greek tragedies, “The Oresteia,” Orestes returns home after seven years, by command of Apollo, to avenge his kingly father’s alleged murder by killing his mother and her lover, goaded on by his sister Elektra. The action drives him to madness, and nothing ends happily. It is a bloody mess. Gary Graves’s “Palace Wreckers” is allegedly an adaption of this ancient tragedy, although perhaps it would be more accurate to describe it as “inspired by.” But that’s a quibble, and anybody who sees this play will be laughing too hard to worry about it. Carla (a character inspired, one presumes, by Aeschylus’s Clytemnestra) is surprised when her children, Elektra and Oresteez show up after seven years, determined to become a family again. Wielding a knife (full of bitterness, fearing intruders, and perhaps feeling haunted by the ghost of her dead husband), Carla does not exactly lay out the red carpet. Nor dues her presumed lover Gus (Aeschylus’s Aegisthus), an hilariously clueless goofball with impressive biceps, who is anxious to meet a deadline for a wrecking job that is all that stands between survival and bankruptcy. Wrecking job? Well, you see, in “The Oresteia” the family is royal and thus live in a palace. In Grave’s version, the palace becomes “Palace Wreckers,” an auto graveyard (also a pun describing the family who certainly wrecked a palace—and how—in the ancient Greek version of the story). Admittedly, it’s all very confusing. Some of the jokes are obscure. For example, our modern Oresteez is not commanded by Apollo, but is obsessed with turning the junkyard into a solar power farm, a business he learned in a cultish community somewhere in America’s bread basket. In the ancient Greek drama, the characters are driven by fate. In “Palace Wreckers,” the sense of foreboding and fatedness is represented by occasional bursts of ethereal music, very disturbing to the characters, seeming to force the action. Will this all end in bloody murder and mayhem? Or will the family transcend their fate and move towards a saner future? Well, it’s a comedy, after all, and it ends happily. The road to happiness, in this case, is paved with laughter. If the plot is confusing, what do we care? We’re too busy laughing to worry about it. Most of the laughter is generated by Jan Zvaifler’s inspired work as Carla, whipping through a gamut of emotions at breakneck speed with never a lapse in her comic timing. As she cracks the whip, the rest of the company follows. I’ve already mentioned John Patrick Moore’s goofy, love stick stud Gus who moons over Carla like a hound. As Oresteez, Khary L. Moye is all cultish earnestness, which is ridiculously endearing under the circumstances. Regina Morones’s rage-driven Elektra is comically out-of-place. The actors play everything in deadly earnest, with outsized emotions, as if they really were performing in a Greek tragedy, and haven’t realized that the plot has been reduced to a nut shell (emphasis on the NUT). Director and playwright Gary Graves is clearly responsible for encouraging this hammy indulgence, and thank goodness for that! Gregory Scharpen’s excellent sound design is practically a character in its own right, from the goofy music (representing, perhaps, the ghost of Agememnon) to the outside sounds of the wrecking yard, his work is pitch perfect. It would be a tragedy to miss this! “Palace Wreckers” plays at the Berkeley City Club through June 10th, 2018. For further information click here. Rating: **** (for an explanation of TheatreStorm’s rating scale, click here. “Palace Wreckers” by Gary Graves, a Central Works Method world premiere (#59) produced by Central Works New Play Theater. Director: Gary Graves. Costumes: Tammy Berlin. Lights: Gary Graves. Sound: Gregory Scharpen. Properties: Debbie Shelley. Gus: John Patrick Moore. Carla: Jan Zvaifler. Elektra: Regina Morones. Oresteez: Khary L. Moye. 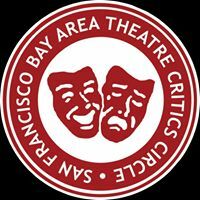 Posted in Reviews.Tagged Aeschylus, berkeley city club, Central Works Theater, Charles Kruger, Gary Graves, Gregory Scharpen, Jan Zvaifler, John Patrick Moore, Khary L. Moye, Oresteia, Palace Wreckers, Regina Morones, theatrestorm.